When L’Eau Serge Lutens was presented to the Parisian press – which now includes the bloggers – I withheld judgment, because a) it was so far ahead of the actual launch that no one else could have commented on it, and b) well, I’d just met Serge Lutens for the first time and he’s really one of the few people in perfumeland who is truly a magical character to me, so that said judgment would have necessarily been affected. I’ve been over my emotions for a little while now, and L’Eau Serge Lutens is out. Serge Lutens’ puzzling move towards “clean”, which could read like a rejection of his previous oeuvre, has been widely speculated upon. Take it at face value, as Mr. Lutens presents it, and it’s a desire for purity in an oversaturated olfactory environment, a way to clean the slate, including his own. Put it in the context of the market, and it’s the addition of a popular style to a line-up that did have cleaner scents, but nothing quite so… minimal: a bid to rope in the mainstream customer, understandable in the current downturn. But let’s talk about the scent, shall we? L’Eau Serge Lutens is a delicate construction of citrusy aldehydes, transparent rose, muguet, magnolia and freesia effects, with a tiny touch of the spiciness you’d find in L’Air du Temps and an abstract green galbanum/hyacinth bubble that tie it in, tenuously, with the current trend for green. The musk base is slightly metallic and haunted by an aquatic note I’d sworn left and right wasn’t in it when I first tested it. But that unmistakable touch of melon (not Calone) is hard to block out once you’ve zeroed in on it and a deal-breaker for me. I’d call it an aquatic magnolia/muguet musk, which lands it square into several current trends – magnolia being the newish olfactory code for “clean” because of its soapy-citrusy facets – less sharp-smelling than, say, Narciso Rodriguez Essence and not as sweetish as Francis Kurkdjian’s laundry orange blossom and musk Aqua Universalis. So, no, it doesn’t smell like a Lutens. It does smells pleasant and it’s got the half-life of plutonium on skin, as white musks tend to. I’ve worn it several times to test it, I certainly wouldn’t buy it, but you could do a lot worse if you’re looking for a clean scent (which, if you’re reading me, you might not be). I still love you, Mr. Lutens, and I understand your need for a change. But you’ll understand me for sticking with Bois de Violette or La Myrrhe, won’t you? When I’m an anti-perfume mood, I just don’t wear any. Image by Madeline von Foerster: Purgatio, from the Solve et Coagula series. Amy, there's more to ESL than just clean -- there are notes, we're not talking just aldehydes and musks, here. And I guess the smell of soap doesn't have much sillage. But clearly, I'm not the target customer. Fernando, it'll probably be a disappointment for Lutens lovers. Of the many ways of doing "anti-perfume", this is the least adventurous one, though as I wrote, it's... well.. nice. Elena, you and I should set up a "La Myrrhe" fan club. Really, if that one ever gets axed, I'm going to shoot myself in the head. On a less facetious note, I'd like to smell L'Eau. There's room for clean in my collection, and I happen to love aldehydes. D. and Dusan, Can I please join that fan club?! I'm actually looking forward to this release. I know a number of people who wouldn't have the foggiest idea what to do with a traditional Serge Lutens fragrance, but would wear the h*ll out a well-composed clean scent. So yeah, I think this is kind of a brilliant addition to the Lutens lineup. "...but you could do a lot worse if you’re looking for a clean scent (which, if you’re reading me, you might not be)." Yep! That would be right. And I also agree that if I'm in an "anti-scent" mood, I just don't wear any. But I think Nathan has nailed this - it's an attempt to capture another segment of the market. Dusan, L'ESL is not hugely aldehydic -- markedly less so the Clair de Musc, for instance. La Myrrhe is the line's hidden gem. A descendant of N°5 by way of the Bible. Christopher, you most certainly can. Although I think it may be more of a cult than a fanclub. Nathan, notwithstanding the commercial purpose of the addition to the line, it's still incongruous to see it in this particular house. Of course the new type of bottle seems to indicate that it could be the start of a new line. Rappleyea, when I was invited to the presentation of Serge Lutens' "anti-perfume", I was envisioning something a lot more radical, perhaps some piece of olfactory research in confidential/art gallery quantities. Amongst the (mostly clueless) beauty editors, I was probably the only one with a deeply puzzled look on my face while smelling the strip. And taking sniffs of my Bois de Violette-scented wrist to reassure myself that I hadn't entered a parallel universe. I'm so confused-- why is he going in this direction? Do you have any clues? Rather selfishly, it puts me in a panic-- I'm just learning about perfume and SL was the line that jumpstarted my madness. They don't all work on my skin, but he seems to have a fascinating aesthetic and an impressive reach in ideas. And now he's going all clean on us? Pooh. I'm going to sit in the corner with my Bois de Violette and sulk. BTW, I love your blog; I'm learning a ton reading it! Anonymous, thanks! Listen, who knows what's going on? A need to renew himself; a need to appeal to a wider market he's never going to nab with his current collections. The question is: what's he going to come up with in the non-export collection. Until then we won't know. It would be interesting to smell this at some point (not that I'm rushing) since I somehow magnify the sweetness in Lutens' fragrances to the point where I may now have diabetes. But the attention-grabber for me was the picture you posted (in the English version). 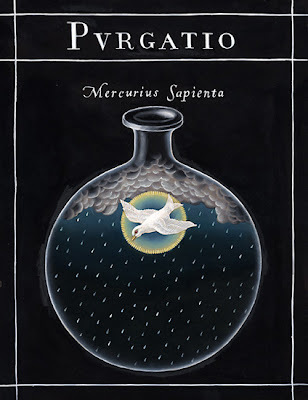 I love that alchemical imagery! It looks more like the sublimatio to me, which strikes me as a very apt stage of the process for something like a "clean" fragrance. Jared, I love Madeline von Foerster's work. She did a whole series on the steps of the alchemical process. It's not the first time I've used her work to illustrate Lutens. Though his aesthetics as a photographer are very different, the alchemical metaphor always springs to mind. Clearly I am not the target market for this scent... but I guess commercially it is a good move for him. It certainly is a departure for the line... maybe he's looking to go in a different direction in future. Was sent a sample so have had a try, and was disappointed. 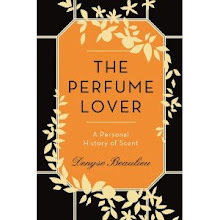 Perhaps it was my expectations - I had been anticipating something more intriguing - something slightly indecipherable and hard to figure or, for that matter, even to smell - something along the lines of L'Antimatiere. But it just seemed "clean" with a capital C - so, paradoxically, not clean at all. Noisy noisy and not quiet. I do understand the impulse - though - to keep revolutionizing oneself, so at least I've got the theory if not the practice. Kit, "noisy" is an interesting way to put it. Aldehydes are high frequency; musks are an invasive buzz. The construction is relatively spare, though. Is noisiness the perception of high olfactory volume, or just the feeling you're being invaded by a music you wouldn't have chosen? Interesting question! High olfactory volume is indeed what I meant - also more conventional odour. But (call it "puzzle migration" perhaps, if not in nose then in brain), I'm now wondering if this isn't really just the sort of thing we might have expected. Reflecting on that interview - the one where he says he is a judge in love with the accused - and speaks in various ways of a fragrance stripped bare, just itself, etc. - that would be very much what this one is. When I think of "clean" not as the absence of "dirt" but like the protest of an accused, made while turning out his pockets - the emphatically asserted absence of anything hidden, more than simple absence itself - the fragrance makes sense within the "logic of Lutens". Maybe I'll give it another try with that in mind. Don't think I'll necessarily like it better, but perhaps I'll at least understand it more. Kit, I'd thought of the "judge in love with the accused" bit as a riff on Jean Genet, an author Serge Lutens says he loves -- he gives "The Miracle of the Rose" as his favorite book. But if the accused is fragrance, then "clean" as in "I'm clean, I don't have anything to hide" makes sense. Especially given Mr. Lutens' unusually un-enigmatic discourse about it, and the venue of its presentation, not the Palais Royal but a nearly empty room in a Mallet-Stevens building. Well, this does not sound like "me" at all but I will certainly try it out. Maybe it is what Fernando said - an example of how to do this style better than others can, as well as a way to open the appeal of the line up to customers who would never dream of wearing MKK or even Arabie. For my part I adore the other "anti-Serge", Nuit de Cellophane, so I am keeping an open mind. As for the reasons behind the launch, and all the ladies who just want to be clean--oh, I don't know. I am in full sympathy with Style Spy's reaction--my mother was very strict about there being no food fussiness in our house and it feels like the same thing, as though they are being fussy little children, which makes me want to shake them (there's a reason I have no children...). I can only hope L'eau Lutens will lead to some chance encounters with the rest of the line for those who might otherwise be afraid. Flora, true, if this draws people to the line who might go on to enjoy some of the more delicate scents in it -- Fleurs de Citronnier or Gris Clair, for instance, why not? I'm all for Serge Lutens picking up new adepts and making tons of money in the process, so that the house goes on producing the scents I *do* love. Alyssa, "clean" must be, for a lot of people who don't have much vocabulary for fragrance, another word for "fresh" -- "fresh" being SAs' favorite word to draw customers in. The opposite I guess is "perfume-y", as in "this feels like an alien presence on me". I think the likes of loud fruity florals, stomach-churning gourmands and clear-the-room florals are to blame for that. 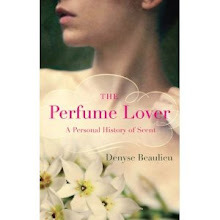 Hi Denyse and all you perfume-lovers! I love when I'm in an anti perfume mood I don't wear any! Rose, I'm never really in an anti-perfume mood myself, but sometimes the nose-brain connection just needs a rest, doesn't it?